Check out this phenomenal 3/4 Accoyo male with beautiful high luster, uniform locks AND fineness! Avanti won Judge's Choice Male Suri, and the deciding factor by the judges was that his britch/chest fiber had incredible fineness! Avanti is having a great show career and we are proud to offer him for stud as an outstanding son of Accoyo Allegiance. Once again Allegiance has proven that he can pass on strong fleece traits to his offspring, as well as a very mild temperament and strong conformation. Avanti's strong Accoyo bloodline influence includes such top herd sires as LCA Accoyo Kotzebue (grand sire), Accoyo Baron (great grand sire), Accoyo Bruxo (grand sire), and of course, our own Accoyo Lucma (great grand dam) and DDF Accoyo Maurizio (med fawn grand sire). Avanti's dam, Sakari, has a VERY fine fleece and this pairing well complemented her fine fleece with Allegiance's curled locks. 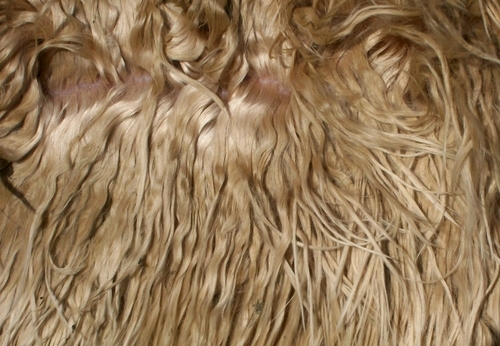 Avanti has a beautiful light fawn cria with intense locks and luster born in 2012. 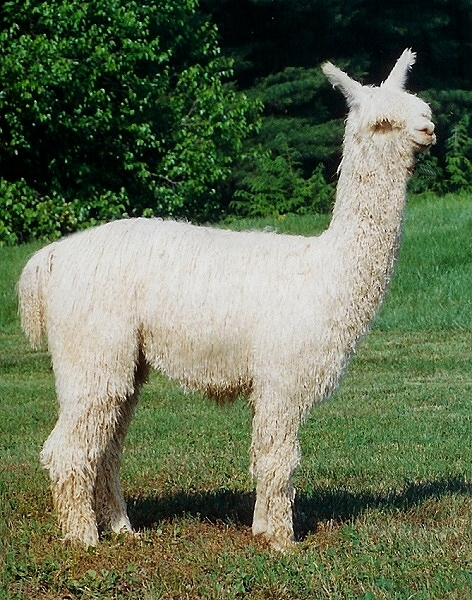 He has unbelievable luster in his 3rd fleece, as well as lock architecture and density. 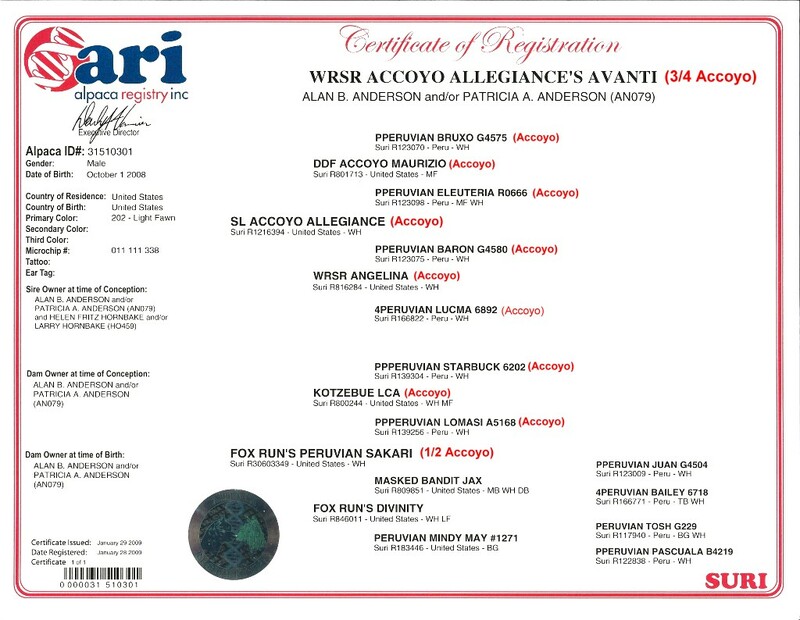 Avanti's latest criation is TRUE BLACK WRSR Hailey by Avanti, a beautiful high luster and locked female out of Balboa's Black Swan of PVA. 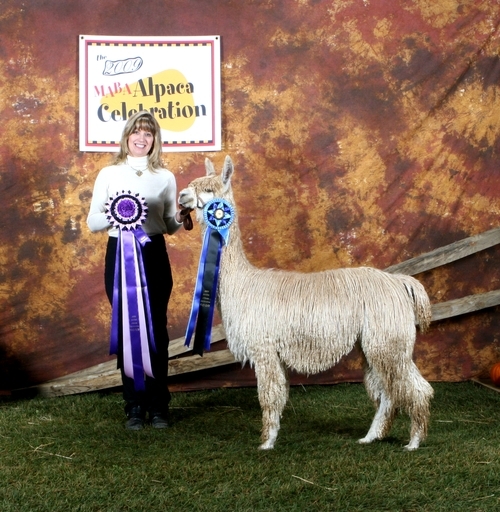 Hailey was awarded Reserve Color Champion at the 2015 Carolina Alpaca Show at her first show! 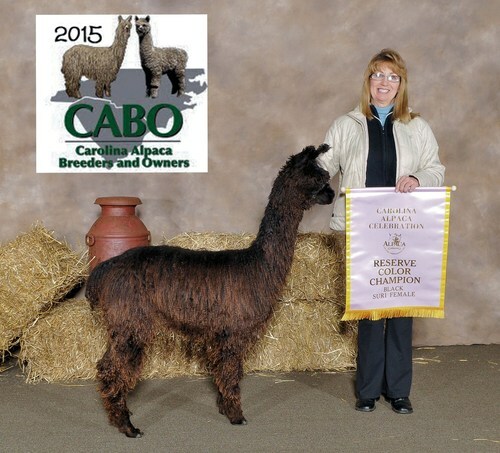 She was also awarded Black Color Champion at the AOA National Fleece Show! 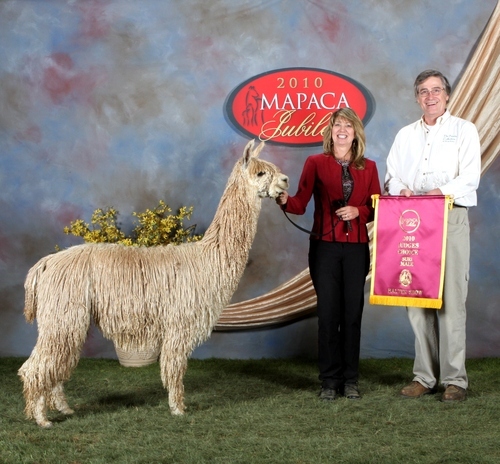 Avanti's fineness has held, as evidenced by his Championship in the Suri Network Fleece Show as well as the 2011 MAPACA Jubilee in his 2nd fleece. His most recent win is 1st and RESERVE CHAMPION at the 2015 Suri Network All Suri Fleece Show, where he was also awarded "The Spirit of the Fiber Industry Award" for his outstanding fleece exemplifying high breeding standards and outstanding fleece characteristics at the at the age of 6.6 years! 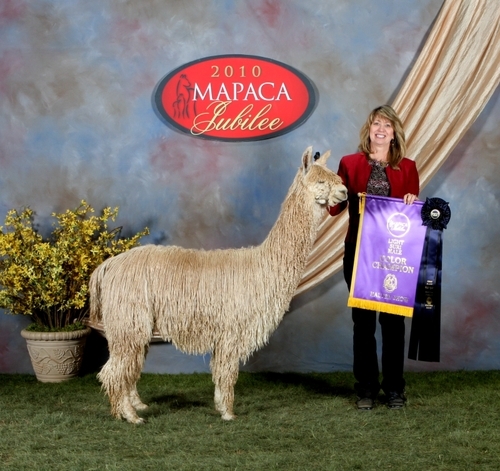 Call Patti's cell at 443-740-4240 for more information and to book your breeding to this Judge's Choice Champion!